Known for its world class skiing, Lake Tahoe was voted a number 1 travel destination on TripAdvisor. You can find any number of activities at this alpine paradise including biking, hiking, kayaking, and parasailing as well as an upbeat nightlife. Both North Lake Tahoe and South Lake Tahoe have many RV campgrounds. This Northern California RV vacation spot is one of your more luxurious options. Not only is it located in picturesque nature, it is close to the Sacramento River, Whiskeytown National Recreation Area, Mt. Lass, and Shasta-Trinity National Forest. In fact, this easy-to-navigate resort was built specifically to accommodate large travel trailers with its wide sites and high quality utilities. Some of the amenities offered include pools, spas, fire pits, car washes, a dog park, and an RV showcase area. Cherry Hill Park, Washington, D.C. Looking to explore our nation’s capital as you travel around the country? 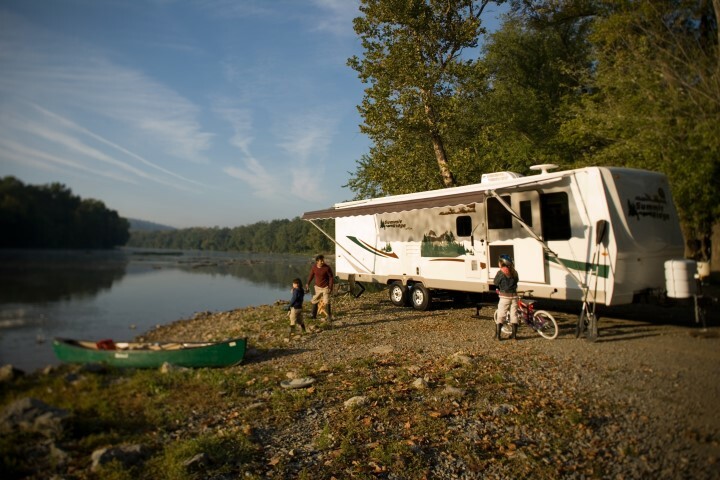 As the closest RV campground to Washington, D.C., Cherry Hill Park is an ideal location. It is just far enough outside the city to relax in nature while also offering a quick commute into all of the capital’s historical landmarks. The park, technically located in Maryland, provides transportation into the city several times a day. Founded in the 1920’s as a farm, even the travel trailer camping site has a rich history. Disney’s Fort Wilderness Resort is a unique vacation spot for parents and children alike. Located in the Magic Kingdom Resort Area, this RV-friendly campsite is fully equipped and features a beach and multiple pools. In its 750 acre forest you can find rabbits, ducks, deer, and armadillos while participating in their variety of recreational activities. The travel trailer site also provides easy access into the park through Disney’s shuttle. When you camp at Mt. Desert Island you’ll find the refreshing combination of scenic New England nature and beach-side relaxation. The Mt. Desert Narrows RV campground offers a pool, free Wi-Fi, a club house, and various areas for sports. It is also within close proximity to Acadia national park and offers a panoramic ocean view from its beach-side campsites. Finally, you can explore the restaurants and antique shopping areas in the quaint, historic town of Bar Harbor. Find the travel trailer that’s right for your RV vacations from RV Wholesale Superstore.